A reliable source for Industrial Mezzanines information and a resource for accessing leading Industrial Mezzanines and suppliers. Industrial mezzanines are raised platforms that are used by a wide variety of industrial companies to create extra space for many applications. All industrial operations are concerned with efficiency. Effective use of workspace contributes directly to operational efficiency, especially for supply and distribution companies that base their operations in warehouses. Industrial Mezzanines Industrial mezzanines are raised platforms that are used by a wide variety of industrial companies to create extra space for many applications. All industrial operations are concerned with efficiency. They create extra storage space, they create spaces from which factory or warehouse floor operations can be observed and they can even accommodate small offices. The tens of thousands of dollars that a company would spend on construction materials and labor costs, permits, taxes and all other manner of expenses can be dramatically reduced by investing instead in a mezzanine system. There are many possible mezzanine configurations. The two main categories into which all of those configurations fall are free-standing and structural. Free-standing mezzanines are the simpler of the two varieties. When a company has already established its operations and requires more space, free-standing mezzanines most easily accommodate existing machinery, workspaces and mobile equipment like forklifts and hi-lows. Industrial Mezzanines - Abtech, Inc. They consist of platforms, beams and columns that can be spaced in a way that minimizes impedance of operations on warehouse or factory floors. If, after installation, they must be moved or torn down, many free-standing mezzanine designs can be easily disassembled or adjusted to make the addition of more platforms and supports possible. They can be designed to varying load-bearing specifications for use in applications ranging from light-duty storage to support for small office spaces. 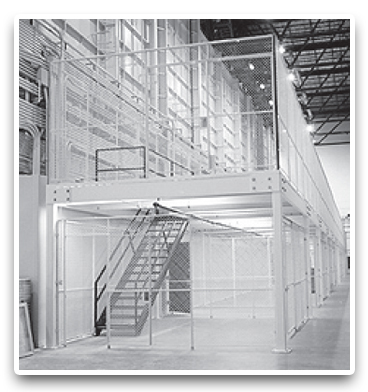 Structural mezzanines are built into the structure of industrial facilities. They are generally much less easily modified than free-standing models, though they have their own advantages. They can sometimes bear heavier loads than can free-standing models and can sometimes even permanently accommodate light machinery. They can be lined with electrical conduits and water pipes, allowing for easy maintenance. They are usually attached to walls, support beams or other strong, structural load bearing components and are intended to be permanent.